A downloadable PDF quilt pattern in two sizes: baby and lap. The baby quilt finishes at 38″ x 52″ and uses 14 FQs to make the quilt top. The lap quilt finishes at 57″ x 78″ and uses 14 half-yard cuts to make the quilt top. 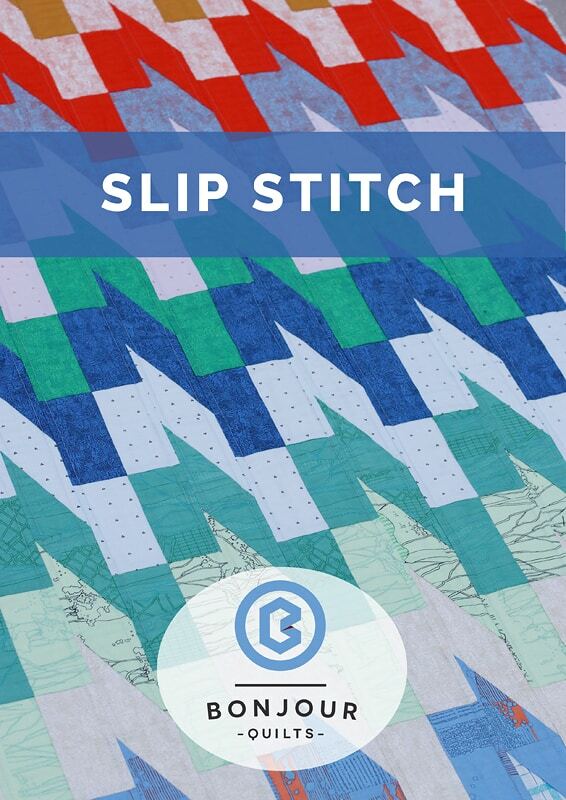 Slip Stitch is a fun modern quilt pattern, perfect for showcasing a favourite fabric line or for pulling together a gorgeous colour scheme from stash. The pattern uses half-rectangle triangles (among other shapes) which are compatible with a Bloc_Loc HRT ruler. However there is NO requirement to have this specialty ruler – the pattern includes a link to detailed, photo-filled instructions on how to trim the HRTS with a standard quilting ruler. Please note – because this is a digital product it cannot be returned for a refund. But please email me if you have any problems – I’m here to help you.